If You Have Bunions, Can You Wear High Heels? A bunion is an abnormal, bony growth on the joint that connects the big toe to the foot. Bunions are often caused by heredity, but they may be caused and aggravated by improper footwear – especially high heels. Can you continue to wear high heels even if you have bunions? The answer to that question is mostly “No!” Even so, there are a few things you can do to ease your painful symptoms so that you can wear carefully chosen fashionable shoes. In this article, we will provide 12 smart tips to help you cope with bunions without wearing Frankenstein footwear. Read on to learn more. 1. Exercise: Stay generally healthy and fit by getting half an hour of light-to-moderate exercise daily. This will help you maintain a healthy weight and good blood circulation for overall good health and improved strength, flexibility and blood circulation in your feet, which helps reduce inflammation. Whenever you are sitting, exercise your feet and ankles by pointing and flexing your toes and feet and circling your ankles one way and then the other. Take your shoes off under your desk and do some heel lifts to flex your toe joints. 2. Prevent big toe overlap with gel toe spreaders. These handy, affordable devices separate your toes and give them a good stretch. Use them for 15 or 20 minutes a day while watching television, bathing or otherwise relaxing. They are very handy to use when trimming and/or painting your toenails. Don’t try to walk while wearing toe spreaders as it’s quite painful and you could really hurt your feet. 3. Use toe spreader socks. There are also toe spreader socks that can be worn while you sleep. These really help ease bunion pain and do a good job of training your toes to straighten out. Again, don’t wear them for walking as you could hurt yourself. 4. Vary the height of your shoes. Change your shoes several times a day, and don’t wear the same shoes to work every day of the week if you have any choice in the matter. Changing the height and style of your shoes keeps your feet flexible and varies the amount of pressure on your toes and the balls of your feet. Switch between slippers, low heels, athletic shoes and moderate heels often. 5. Avoid very high, skinny heels. Save extremely high, stiletto heels for events where you will be sitting the entire time. This type of heel puts a tremendous amount of pressure on your bunions. Be sure to pack a pair of foldable flats in your handbag in case you simply cannot tolerate your fancy shoes. 6. Wear shoes with stable soles. Many dress shoes have leather or other sorts of slick soles. Avoid these and instead choose shoes that have cushioned, non-slip, textured soles. Slipping and sliding will only aggravate your bunions. Stable soles are more comfortable and give some protection to painful bunions. 7. 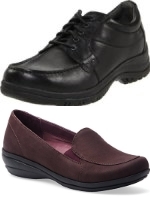 Choose shoes made of soft materials. Moderate-to-high heeled shoes made of a soft, natural leather can be cleaned, oiled and polished to be kept in good, flexible, breathable condition. High quality shoe leather will stretch and conform to the shape of your foot and is much more comfortable than non-yielding man-made materials. 8. Avoid shoes that need to be “broken in”. If shoes do not fit you just right the first time you put them on, don’t buy them. Any pressure on your bunions will aggravate and inflame them and cause pain. No matter how cute a pair of shoes looks, if they pinch your feet at all, don’t buy them. 9. Learn to walk right. Many women who have become accustomed to wearing high heels walk toe-to-heel instead of heel-to-toe. This puts all your weight on your bunion when your foot hits the ground. If you find yourself doing this, be mindful of having your heel hit the ground first, and roll your weight to your forefoot. This should help ease your bunion pain and may also help with any back pain you may have been experiencing. 10. Wear open-toed shoes as long as the strap that goes across the top of your foot doesn’t put pressure on your bunion. Sandals or open-toed shoes that fit just right can be very comfortable for feet with bunions because they alleviate all pressure. Look for styles that discreetly cover your bunion without rubbing and pressing against it. 11. Be sure that any shoes you choose have a minimum of a half-an-inch of room between the tip of the shoes and your toes. 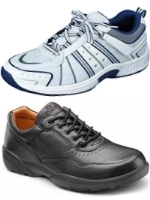 Avoid pointy-toed shoes and those that allow your feet to slip forward into the toe box. You should always be able to wiggle your toes and spread them a bit. 12. Use orthotics and inserts. There are many different types of pads and supports available that can help ease bunion pain. Bunion sleeves made of a comfortable gel material can provide padding and protection for painful bunions. Toe crests can help hold your toes in the right position to prevent pressure on your bunion. Ball of foot pads also provide a surprising amount of relief from bunion pain. Having the right type and amount of arch support goes far toward alleviating all kinds of foot pain. Wearing high heels when you have bunions is not recommended, but if you take good care of your feet, choose your footwear carefully and alternate your shoes frequently, you can probably wear moderate heels occasionally and dramatic heels once in a great while. Just remember that it pays to be prepared by keeping an extra pair of comfortable shoes on hand at all times.